Dr. Roop seeks to advance HIV vaccine design efforts by studying the unique antibody response of infants infected with HIV. The 36 million people worldwide who are infected with HIV are at an increased risk for many forms of cancer. Infants who acquire HIV from their mothers rapidly develop broadly active antibodies that are capable of neutralizing a wide diversity of global HIV strains. An understanding of the developmental processes involved in eliciting this broad and potent response may reveal clues vital to vaccine design efforts. 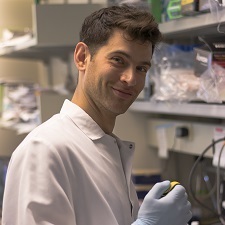 His research will develop a novel experimental protocol that will allow a detailed characterization of these infant antibodies, as well as reveal insights into the unique developmental processes by which they arise. Project title: "Defining virus-host co-evolutionary dynamics that underlie the unusually broad HIV neutralizing antibody response in infants"